There is still a notable lack of consensus over when exactly the 2007-09 financial crisis started. This column argues that the crisis began on 9 August 2007, when BNP Paribas announced they were suspending redemptions. In 2007, the US and European financial systems lacked two key shock absorbers: adequate capital to meet falls in asset values, and adequate holdings of high-quality liquid assets to meet temporary liquidity shortfalls. Lacking these, the financial system was vulnerable to even relatively small disturbances, like the BNP Paribas announcement. In our view, 9 August 2017 marked the 10th anniversary of the start of the financial crisis. That was the day that BNP Paribas announced they were suspending redemptions because their fund managers could not value the assets in three mutual funds. With a decade’s worth of hindsight, we view this anniversary as a propitious moment to review both the precursors and the start of the worst financial crisis since the Great Depression of the 1930s. But, first things first – what is a financial crisis? In our view, the term refers to a sudden, unanticipated shift from a reasonably healthy equilibrium – characterised by highly liquid financial markets, low risk premia, easily available credit, and low asset price volatility – to a very unhealthy one with precisely the opposite features. We use the term ‘equilibrium’ to reflect a persistent state of financial conditions and note that – as was the case for Humpty Dumpty – it is easy to shift from a good financial state to a bad one, but very difficult to shift back again. The bad state is usually associated with increased co-movement of asset prices; contagion across firms, markets, and geographic jurisdictions; and an adverse feedback between the financial system and the real economy, so that as one deteriorates it makes the other even worse. Below are two charts that highlight the dramatic impact of the 9 August 2007 Paribas event. Both exhibit a sudden shift from a good equilibrium to a bad one (which proceeded to worsen further as the crisis advanced). In Figure 1 we show the classic fever thermometer of the crisis – the US dollar three-month LIBOR-OIS spread – at a daily frequency (the red line). This spread is the difference between the interest rate at which top-quality banks in London claimed to be able to borrow from other banks in the uncollateralised market (LIBOR) for three months and a proxy for the expectations over the next three months of the safest, most liquid, nominal interest rate. 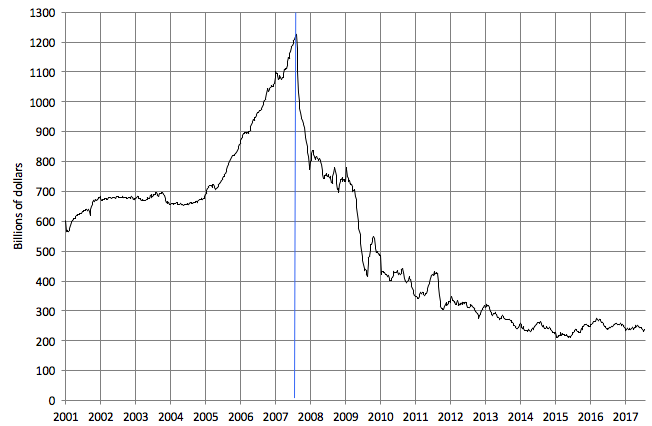 It jumps on 9 August and does not sink back below this heightened level until after the Federal Reserve publishes the results of its first stress tests on 7 May 2009 (see Board of Governors of the Federal Reserve System 2009). The chart also highlights the rapid contagion of strains in this critical dollar funding market to the short-term market for funding in euros (the black line). Note: Vertical blue line denotes 9 August 2007 (BNP Paribas announcement). 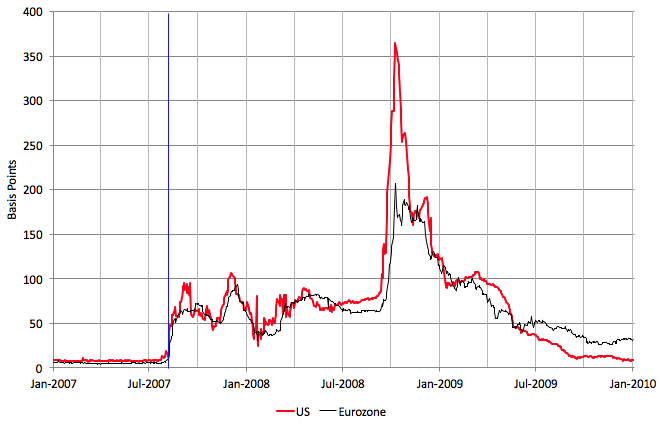 We focus on the LIBOR-OIS spread because of what it measures. Viewed in isolation, the spread between the rate charged for providing a loan to a bank and one for a risk-free loan reflects the combination of a liquidity premium and compensation for counterparty risk. As the spread widens, we can infer that either liquidity is more expensive, the perceived risk of default is higher, or some mix of both. It seems likely that the initial shock was dominated by a broad scramble for liquid funds, as alternative means of financing suddenly dried up (especially in dollars and for shadow banks). However, during the remainder of 2007, as central banks moved aggressively to reduce bank (and shadow bank) short-term funding costs, the persistence of the LIBOR-OIS spread increasingly pointed to worries about counterparty solvency (see Cecchetti 2007). Other indicators of funding disruption, such as the cross-currency basis swap with its large and widening deviations from covered interest parity, exhibit the same pattern (see Cechetti and Schoenholtz 2016). Figure 2 shows the (weekly) outstanding volume of asset-backed commercial paper (ABCP) – securities used by a range of intermediaries to fund large, highly-leveraged positions in mortgage-related securities (including mortgage-backed securities, MBS, and derivatives such as collateralised debt obligations, CDOs). The business model supporting the issuance of this debt simply collapsed on 9 August. In previous years, banks had used their off-balance-sheet special investment vehicles (SIVs) to exploit this collateralised funding approach, allowing them to conceal increases in leverage and risk exposure. At its height, these SIVs financed more than $400 billion worth of mortgage-related assets, with no more than a tiny capital cushion (Davis et al. 2008). Why did the funding disappear so suddenly? With hindsight, we can see that the purchasers of ABCP did not believe that they were being adequately compensated for the risk of SIV failure once mortgage delinquencies and defaults started to rise and it became clear that the market for the underlying mortgage-related instruments had evaporated. After 9 August, investors recognised both the need and the inability to figure out which intermediaries holding mortgage-related instruments were stuck with the toxic components and which ones were not. This same challenge applied to the market for repurchase agreements where people were using these instruments as collateral for short-term loans. Gorton makes an analogy to the problem of tainted meat. Imagine you wake up one morning to news that some part of the hamburger supply is contaminated with a dangerous form of the bacteria E.coli. Most of us are not equipped to run safety tests on the meat that we purchase, so our natural reaction is to shift to eating something else for a while. In the same way that news about E.coli leads households to steer clear of hamburger, investors who are unprepared to undertake a detailed examination of structured financial products will stop buying them, accepting them as collateral, or lending to inadequately capitalised entities that hold them. Having failed to screen the ultimate borrowers adequately in advance, post-Paribas adverse selection undermined a range of financing mechanisms that relied on the collateral value of structured credit. The result was a large negative shock to the aggregate supply of credit precisely when intermediaries’ need for funds surged. Why did this all happen on the day that it did? Even a brief scan of the timeline below leads anyone (including us) to wonder what was so special about 9 August. The credit-fuelled boom in US housing prices had ended more than a year earlier; by the latter half of 2006, housing starts already had plunged by more than 20% year-on-year. Mortgage-related tensions had been evident for some time, as delinquencies were rising and prices for various tranches of MBS derivatives were falling. Key lenders in the subprime lending boom already had withdrawn or failed. Some banks had warned about mortgage-related losses. Prominent ‘expert-managed’ funds that specialised in mortgage-related securities had been wiped out. Sources: Selections from FRB St Louis Crisis Timeline, FRB New York Financial Turmoil Timeline, BIS Timeline of Key Events, Lauder Institute Timeline; various news clippings, and authors. In our view, however, the real question is different: why was the financial system so vulnerable that a relatively small disturbance could start a conflagration? When civil engineers build bridges, they look for ways to make them resilient to shocks, like high winds or the synchronised footsteps of pedestrians (consider the Tacoma Narrows bridge collapse in 1940 or London’s wobbly Millennium footbridge). Fortunately, engineers observing a vulnerability can temporarily close a bridge and install shock absorbers to make it function safely (as the builders of the London footbridge did in 2000). We can’t shut down a modern financial system – at least not for long – without undermining the broader economy. So system designers must anticipate the need for shock absorbers. With the benefit of hindsight, we can say with confidence that the US and European financial systems in 2007 lacked two key shock absorbers – adequate capital to meet falls in asset values and defaults, and adequate holdings of high-quality liquid assets to meet a temporary liquidity shortfall. In 2007, by far the more important vulnerability arose from a shortage of capital. As Greenlaw et al. (2008) describe, mortgage losses undermined the capitalisation of highly leveraged intermediaries, making them prone to runs. And, as Greenlaw et al. (2011) further explain, creditors have no incentive to wait for intermediaries to become insolvent before they run – as a result, the threshold for a run usually occurs when the value of assets still exceeds those of liabilities. Had commercial banks, SIVs, money market mutual funds, investment banks and the like been adequately capitalised and sufficiently stable debt financing, central banks’ aggressive efforts to supply credit after August 2007 would likely have been adequate to lower funding costs and liquidity premia. These policy actions might also have provided time for creditors to figure out which of the mortgage-related securities were truly toxic. While the aggregate capital shortfall is important for the system as a whole, shortfalls also matter for the individual intermediaries. To see this, consider the NYU Stern Volatility Lab’s estimates of systemic risk (SRISK), defined as the expected capital shortfall of an individual financial firm conditional on a large decline in the equity market. SRISK constitutes a real-time stress test both of specific financial firms and (viewed collectively) of the broader financial system.2 At the end of July 2007, shortly before the Paribas shock, only 20 of 93 large US intermediaries exhibited any expected capital shortfalls. Of these 20, however, the top ten accounted for 88% of the aggregate (SRISK) shortfall. Strikingly, over the course of the crisis, during the following 18 months, nine of these ten were either closed, folded into other intermediaries, nationalised, or bailed out with government equity injections as part of the 2008 Troubled Asset Relief Program! Had SRISK (or another measure of systemic risk) been publicly available in 2007, observers would have known the seriousness of the capital shortfall both for individual institutions and for the system as a whole well before the more acute phases of the crisis developed in 2008. 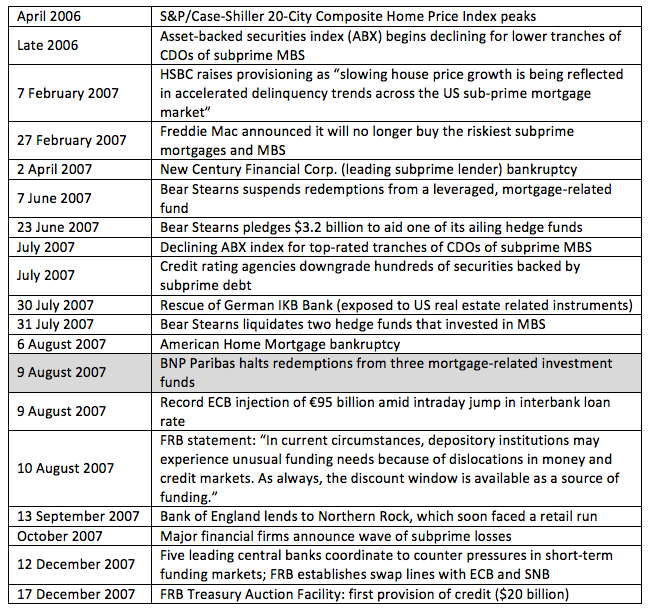 The bottom line is that with the hindsight of 10 years, key facts about the financial crisis of 2007-09 become clear. What started as a loss of liquidity in the markets for complex, opaque mortgage-related instruments, on 9 August led suddenly to the evaporation of funding liquidity for intermediaries holding these securities (or trying to use them as collateral). It happened then because the system was exceptionally fragile, leaving it vulnerable even to small disturbances. And, by then, since European banks had been active in these US markets, the problem was broadly international in scope (at least in Europe and North America). But, what made the crisis so deep and long – and so damaging to the global economy – was that the losses hit a financial system that was inadequately capitalised from the start. We hope that, as we experience the 10th anniversary of key crisis events in coming months and quarters, regulators and market participants will take a moment to recall these hard-learned lessons. Editors’ note: An earlier version of this column appeared on www.moneyandbanking.com. Acharya, V, R Engle and M Richardson (2012), “Capital shortfall: A new approach to ranking and regulating systemic risk,” Voxeu.org, 14 March. Acharya, V, T Philippon, M Richardson and N Roubini (2009), “Prologue: A bird’s eye view: The financial crisis of 2007-09: Causes and remedies,” in V Acharya and M Richardson, (eds. ), Restoring Financial Stability: How to Repair a Failed System, John Wiley & Sons: Hoboken, NJ: 89-137. BNP Paribas (2007), “BNP Paribas Investment Partners temporarily suspends the calculation of the Net Asset Value of the following funds: Parvest Dynamic ABS, BNP Paribas ABS EURIBOR and BNP Paribas ABS EONIA,” press release, 9 August. Board of Governors of the Federal Reserve System (2009), The supervisory capital assessment program: Overview of results, 7 May. Cecchetti, S G (2007), “Federal Reserve policy actions in August 2007: Frequently asked questions (updated),” Voxeu.org, 15 August. Cecchetti, S G and K L Schoenholtz (2016), “Rewriting the textbook: Covered interest parity”, Moneyandbanking.com, 17 October. Davies, P J, A Sakoul and G Tett (2008), “Sigma collapse ends shadow bank project”, Financial Times, 2 October. Diamond, D W (2007), “Banks and liquidity creation: A simple exposition of the Diamond-Dybvig model”, Economic Quarterly of the Federal Reserve Bank of Richmond 93(2): 189-200. Diamond, D W and P H Dybvig (1983), “Bank runs, deposit insurance, and liquidity”, Journal of Political Economy 91(5): 401–19. Gorton, G B (2008), “The panic of 2007”, in Maintaining Stability in a Changing Financial System, proceedings of the Federal Reserve Bank of Kansas City Economic Policy Symposium at Jackson Hole, 131-262. Gorton, G B (2010), Slapped by the Invisible Hand: The Panic of 2007, New York, NY: Oxford University Press. Greenlaw, D, J Hatzius, A Kashyap and H Song Shin (2008), "Leveraged losses: Lessons from the mortgage market meltdown", Proceedings of the US Monetary Policy Forum. Greenlaw, D, A Kashyap, H Song Shin and K Schoenholtz (2011), "Stressed out: Macroprudential principles for stress testing", Proceedings of the US Monetary Policy Forum. Lo, A (2012), “Reading about the Financial Crisis: A twenty-one-book review”, Journal of Economic Literature 50(1): 151-178. See Archarya et al. (2012) for a description of SRISK.